One of the most reliable and inexpensive ways to determine the age of archaeological remains is called dendrochronology. In the early 20th century dendrochronology, which is also called tree-ring dating, provided archaeologists with precise dates for all of the ancient Anasazi (Ancestral Pueblo) sites in the Southwestern United States. Dendrochronology determines dates by examining the annual growth of tree rings. The method was discovered by an astronomer named Andrew E. Douglas who was looking for a way to determine the Sun's energy. He discovered that the year-to-year variations in the growth of the tree-rings was the same over the entire region. In addition, Douglas discovered that the thickness of tree rings was associated with the amount of rainfall that occurred during that year. He determined that each ring in a tree represents one year of growth. Drought years produced narrow growth rings, while years with ample rain produced wider rings. Douglas was fortunate that he began his work in the Southwest because the dry arid environment enhances preservation. In the 1920's, Douglas began cataloging tree data by cutting down a very old ponderous pine. He now had long term tree-ring chronological data going back many years. 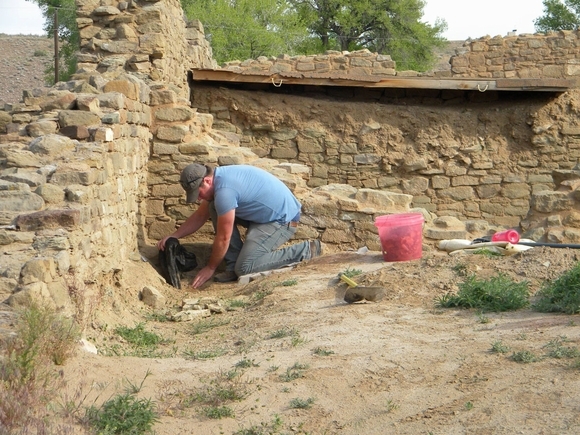 Next, in an attempt to chronologically chart tree-rings from ancient times he began mining the various Anasazi archaeological ruins for support timbers and beams. Despite his persistence, for many years a chronological gap remained, and because of the gap for many years scientists were unable to determine exact dates. Then, during an expedition in 1929, archaeologists discovered the missing link in Showlow, Arizona. Finally all of the tree sequences could be connected. Almost overnight, any wood found at archaeological excavation sites could be compared with tree-ring sequences and an exact date could be determined. By the end of the 1920's Douglas was able to determine dates of timbers found at archaeological sites in the Southwest to the year 700 AD. There are, however, some short comings when it comes to dendrochronology. First, Native Americans were known to shave off the outer rings or layers of their logs. It is impossible to determine how many layers were removed. Timbers that were used in home construction were especially susceptible. This can lead to estimates that are too recent. Another factor, that can make it difficult to determine a date was that good wood for construction was so scarce that it was sometimes taken from old archaeological sites and reused. This sometimes leads archaeologists to dates that are too old. Tree-ring dating does not work well in parts of the Eastern United States where the rainfall and climate are similar almost every year. Tree-ring dating works the best where the wood is best preserved, and the growing conditions varied from year to year. Both the Arctic and the Southwest desert are extreme environments for growing trees, and both of these environments produce consistent variations in tree-ring sequences. Tree-ring chronologies are now being constructed all over the world. Recently, scientists mapped the tree-ring sequencing of the North American bristle cone pine back over 8,000 years.